I first heard of Russian post rock band IWKC – short for I Will Kill Chita – a few years ago when their ambitious album Evil Bear Boris was met with great reviews in Western Europe. 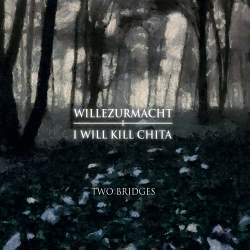 So when I was contacted by them to check out more of their music, I decided to risk an ear on Two Bridges, a collaborative album they recorded last year with German post-structuralist noise duet Wille Zur Macht. Both bands met while playing shows in Zweibrücken in the German state Saarland, and were so excited about each other’s music that they decided that they had to record an album together, and in honour of the town where they met, they decided to call it Two Bridges, which is the town’s translation into English. The album was recorded already in 2015, but somehow disappeared from the musicians’ minds. Recorded live and without overdubs, this is of course improvised music, but the musicians have such a good chemistry together that it makes for a really engaging listening experience. Four of the album’s tracks are "short", meaning between five and six minutes long. These tracks may remind more of IWKC’s sound as they have a clear rhythm and are also more song based. Take for instance the opener Siebente Einsamkeit which comes with a dubby bass line and some searing synth warbles to give it a rather trippy atmosphere. Als ich einst Abschied nahm is a more regular post rock track with a melancholic melody, maybe not very original, but still very pretty indeed. Ein Abgrund ohne Schranken has a darker and more gothic feeling, whereas Warm atmet der Fels tries to flirt with Eighties dark wave sounds. Different from the rest but also the least interesting moment on the album. The highlights are the second track, Morgenröte, at ten minutes a really generous piece of music that highlights what happens when improvised music does everything right. It starts as an ambient piece of electronic music, but soon the drums slowly join in, and sometime halfway through the track, this becomes a grand piece of post rock with an unforgettable bass line, like the kind of stuff Godspeed You! Black Emperor did in their best years. The concluding Die Wüste wächst is an eighteen-minute behemoth of purest drone that still manages to build up tension and momentum. It must be really hard for all involved musicians to grow within the song at the same rhythm. On this album, it’s the two more experimental tracks that really surprise by being incredibly successful, whereas the more normal songs are also good without standing out as much. Usually, collaborative albums are less than the sum of its parts, but in this case, we have to deal with a rare gem that should appeal to fans of post rock that don’t mind digging into more experimental waters.